Looking south from Mt. Elwell peak, with Long Lake and the Sierra Buttes. The plan: The Mount Elwell peak in Plumas National Forest, near Graeagle, Calif. Some 14 years ago, Shannon and I both said “I do” on a nice piece of earth overlooking Lake Tahoe. It sure seems like we’re usually in Oregon each year for our anniversary on our usual camping trip or visiting friends in Bend, but we weren’t leaving this year for another day or so. The in-laws agreed to take the kids for the day, so we packed up with Moose and headed north out of Reno. Included on my hiking to-do list this year was exploring more of the Graeagle region. I’ve spent a little time in the area, but mostly playing golf as there are a couple fun tracks up there. I had a hike planned last year for the Sierra Buttes and it was scrapped, for reasons I can no longer remember. We have a camping trip scheduled for later this summer in which I am planning to get that Sierra Buttes hike done. So for this day, we settled on Mt Elwell, a 7.25-mile loop that promised expansive views and picturesque lakes and streams. Thankfully, the hike is a loop because we botched the directions from the moment we left the car. There’s a scattered parking area by the trailhead. We parked and grabbed our things and immediately launched on the trailhead in front of the car. Less than a half-mile later, we hit a junction that didn’t make sense based on the descriptions from my man Mike White. A nice couple was nearly at the junction and we asked if they could see us in the right direction. The woman had done the Elwell hike the week before and pointed us in the direction of the trail going up the south face (and also mentioned snow covering patches on the north side). We couldn’t officially confirm it until we returned to the parking area after the hike but at that point I suspected there are trailheads coming off of two different places in the parking area as the White guide describes the ascent up the northern side of Elwell and descending south towards Long Lake. We continued in the direction we were pointed and soon came about a quarter-mile spur trail to Hawley Falls, which turned out to be a rewarding side trip with the falls still gushing from the snowmelt. Back on the trail, we slowly climbed a bit, with the terrain gradually changing from the gentle dirt path to rockier tread. 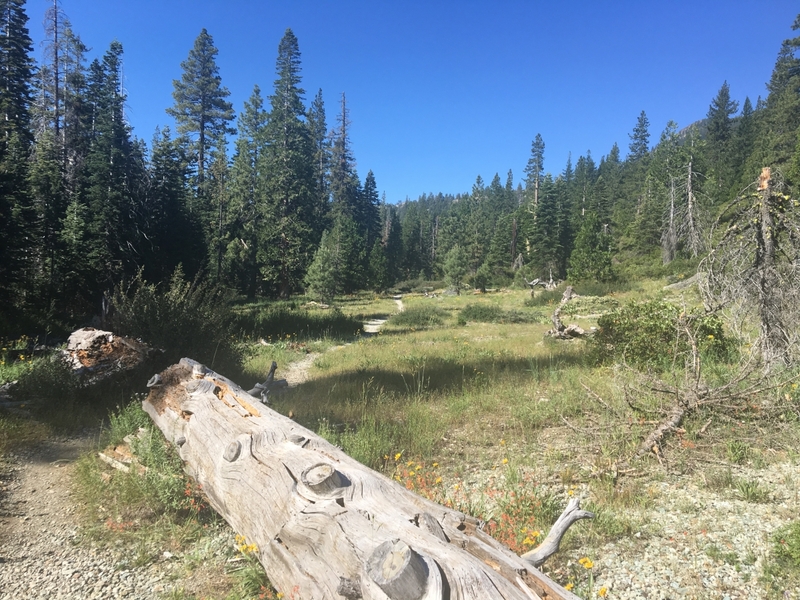 There are a couple of stream crossings along the way and the trail dances past a small pond as well before reaching a bit of a ridge where Long Lake comes into view. Long Lake in a word: stunning. Crisp blue waters surrounded by the greens of the forest, and the gray granite rocks – not to mention the small islands dotting the lake — makes for one helluva sight. Approaching Long Lake from the northeast. Long Lake, from the trail looking south. A junction in the trail sent us right along the north end of the lake, and we noted the left trail led to a campground for potential future trip. 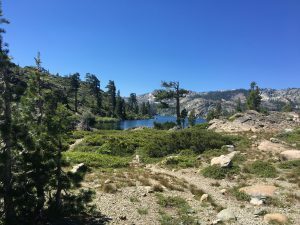 The trail got a little difficult here – not because of elevation but because the terrain gets quite rocky and you want nothing more than the look at the beauty of the lake as you’re moving about. And as you look at the lake, you might ignore that Mt Elwell is essentially looming behind you. We cleared around to the northeast side of the lake, where a junction yielded a quick rest stop before a massive climb to the top. I don’t have a GPS unit other than phone apps (which we weren’t using), but I’d suspect it was a climb of about 1,000 feet in less than three-quarters mile from our rest stop to the top. But the top is so worth it. There are two peaks and the northwestern one is the tallest at 7,818. The views gained from the summit are phenomenal. 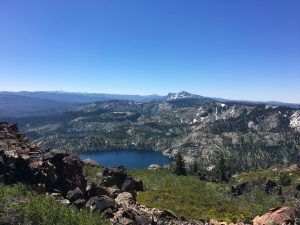 To the south, the Sierra Buttes stick out beyond Long Lake, Bear Lake, Silver Lake and Round Lake. Two other points on my to-do list – Mt. Lola to the south, and Lassen Peak to the north, were quite visible from the top, as was Eureka Peak. Also visible was the aforementioned snow on the north side. A group coming up that way scrambled up and through with trekking poles. Per usual, I had forgotten my sticks. We spent a few minutes searching for a decent route down through the snow, which was probably at least 200 in some areas and came up with nothing that didn’t come with a decent chance of slipping. So we decided to add a bit of fun to the day and slid down the snow, which proved to be quite refreshing. Our descent down the north side was a pleasant jaunt in the share of the forest on a decently marked trail. Eventually we came about three ponds, which, based on Moose splashing through each of them, are not very deep at all. The trail all the way back, past the Smith Lake junction, to complete the loop, was quiet, peaceful and relaxing. Confirming suspicions, our arrival at the parking area came at a different trailhead across the way from where we had started. Gear: I had been looking for a decent little day-hike pack – something to fit a bladder with enough space for water for Moose, a jacket, snacks and other odds and ends for day hikes. I picked up the Osprey Daylight Plus earlier in the spring and today was the first hike with it. Loved it and very much recommend it. I think is a 20-liter pack. My 2.5-liter bladder fits perfectly in the external slot. There’s a small front pouch perfect for keys and a pocket knife and the main pouch very comfortably holds Moose’s collapsible water bowl, a water bottle, snacks and more. I wore my Under Armour high-tops and was glad I did considering some of the rockier sections of the trail around Long Lake. Per usual, I forgot my walking sticks. 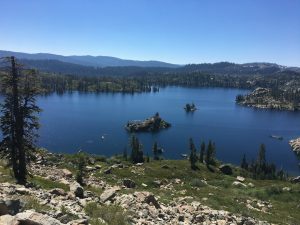 Post-hike beer: A visit to one of my favorite places – The Brewing Lair of the Lost Sierra in Blairsden, Calif. This small brewery is incredibly cool, and incredibly easy to miss if you’re not looking for it. They’re located just off Highway 70 a little east of the junction with Highway 89. They trend to the hoppier side of things and today was capped with a terrific single-hop pale ale – Mosaic Solo. If you are in the area, go there. Kid friendly. Dog friendly. Awesome patio/deck and an on-site disc golf course, if that’s your thing. Go there. Seriously.